Topkapi Palace was not only the home of the sultans but also the empire's administrative center and the seat of its legislative, judicial and executive functions. At the same time it was also an academy of fine arts where artists plied their trade, and a conservatory where the arts of music and dance were taught and performances and concerts organized. This miniature city which housed thousands of people suffered numerous fires and earthquakes over time, and its damaged structures were repaired and restored. Displayed in the palace were the porcelains, jewels, carpets, inscriptions, paintings, miniatures and even weapons, each one a work of art, received by the sultans as gifts or brought back as spoils of military conquests. EUROPEAN WITNESSES OF OTTOMAN SPLENDOR: After Fatih Sultan Mehmed the Conqueror took Istanbul, a palace was constructed on the spot where the central building of Istanbul University stands today. When this palace soon proved unable to meet the needs of the imperial administration, however, it was decided to build a new one. The site of the former Byzantine acropolis was chosen, bounded by the Golden Horn, Seraglio Point and the Sea of Marmara, and the area was closed off from the city by walls. The Audience Hall, the Privy Chamber, the Treasury and the Public Records Office were all built here. Although the exact date of construction of the new palace is not known for certain, it is estimated to have been built between 1472 and 1478. Not only did the 16th century sultans have additional structures erected during this period when the empire was at its zenith but later sultans had damaged buildings repaired in various styles. 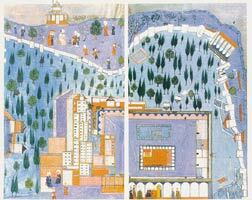 This activity continued until the 19th century, with the result that it is instructive to compare engravings and paintings of Topkapi Palace in the 16th century with its appearance today. We can also catch glimpses of various sections of the Palace in the 16th century from surviving manuscripts illuminated with miniatures. The most important of these are in the first volume of a book entitled the Hunername, housed in the Topkapi Palace Library. We have included here three miniatures from this volume, as well as miniatures showing the Pavilion of Murad III from the first volume of the Sahinsahname, which depicts scenes from the life of that sultan. We have also made selections from three volumes of paintings by European artists of the time, two in the Austrian National Library, the other in the Dresden State Library. The artists who made these paintings, some of them historians, were members of the embassy delegations of the so-called Holy League or Habsburg Empire. Both their drawings and their writings are reliable sources of detail. AT THE COURT OF MURAD III: The miniature depicting the First Gate (Imperial Gate), the First Court, and the Second or Central Gate (Gate of Salutation), indicates that the First Gate was apparently covered in tiles in that period. The miniature depicting the First Gate (Imperial Gate), the First Court, and the Second or Central Gate (Gate of Salutation), indicates that the First Gate was apparently covered in tiles in that period. This detail is not however apparent in the picture taken from the Vienna album, in which the dome of Hagia Eirene is visible. The armory depicted in the miniature showing the tiles was used as a weapons depot, and next to it stood the Firewood Depot. The small structure on the right was a 120-bed hospital known as the Enderun Hospital or Hall of the Sick. The pavilion at the top was the Pavilion of Justice, where petitions submitted by the common people were processed. This detail is not however apparent in the picture taken from the Vienna album, in which the dome of Hagia Eirene is visible. The armory depicted in the miniature showing the tiles was used as a weapons depot, and next to it stood the Firewood Depot. The small structure on the right was a 120-bed hospital known as the Enderun Hospital or Hall of the Sick. The pavilion at the top was the Pavilion of Justice, where petitions submitted by the common people were processed. Through the Second Gate (Gate of Felicity) one passes into the Second Court, the Court of Justice or Court of the Imperial Council. The palace kitchens are located behind the wooden porticoes on the right-hand side of the miniature depicting this section. On the left is the Court of the Imperial Council, also known as the Kubbealti, literally .Under the Dome.. Here too is the Sultan's Pavilion, from which the padishahs followed the proceedings of the council of state. The padishah who is watching the seven Kubbealti vezirs and the Grand Vezir.in the center dressed in white.from the Sultan's Pavilion must be Murad III. The building adjacent to the Sultan's pavilion is the Public Records Office. Money was stored in the large earthenware jars in the Outer Treasury next to the Kubbealti. Depicted with gazelles in the miniature, the Second Court, where lions and tigers were occasionally allowed to roam, was never entered on horseback. THE GATE OF FELICITY: The Third Court is entered through the Third Gate or Gate of Felicity. Guarded by the White Eunuchs, it was also known as the Gate of the White Eunuchs, or the Audience Gate since it led to the Audience Hall. 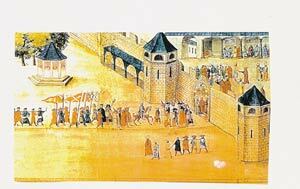 Ceremonies such as coronations and the handing of the imperial standard to the Grand Vezir before he set off for war were held in front of this gate. 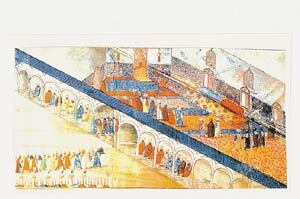 Sections of the First and Second Courts are depicted in one of the miniatures from the Dresden album. Captives brought back from a military campaign are shown about to pass through the Second Gate. At the top left is the Pavilion of Justice. Another miniature depicts the White Eunuchs. Porters bearing gifts brought by an embassy delegation are carrying them through the gate. The miniature depicting the Audience Hall is taken from the Vienna album. The ceiling decorations here, the tiles that half encase the walls, the carpet on the floor, the windows, and the sofa and the cushions on it all reflect the refined taste of Ottoman art. The sultan seated in the right-hand corner is Murad III and the younger man to his right is, with great probability, his son and successor, Mehmed III. PRIVY GARDENS DOWN TO THE SHORE The Third Court, which constituted the inner palace, was also known as the Enderun Court. A plan of it shown in a miniature from the Hunername depicts the facades of the buildings lying flat on the ground in the horizontal plane. 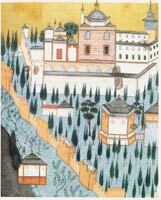 The dense group of buildings in the background is the Harem. The red rectangle at the entrance is the Audience Chamber, which was the sultan's reception hall. In the Third Court are the Pavilion of the Conqueror (the Inner Treasury), the Privy Chamber (where the Sacred Relics are exhibited today), the Dormitory of the Expeditionary Pages and, behind it, the Meskhane or School of Music. Musicians, singers, dancers, poets, barbers and miscellaneous servants were trained in the Dormitory of the Expeditionary Pages. Also visible here are the Imperial Gardens, which extended from outside the walls all the way down to the sea. 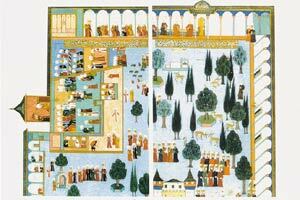 Meanwhile the miniature in the first volume of the me shows the facade of the Harem and, in front of it, the Pavilion of Murad III with its garden. 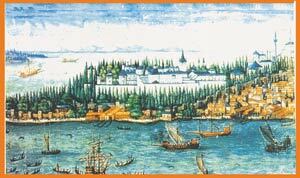 There is also a panorama of Istanbul in the Vienna album which accurately depicts all the buildings from Sarayburnu (Seraglio Point) up to the quarter of Eyup. We have chosen here a view of Topkapi Palace from the Golden Horn, a miniature in which a portion of the Haghia Sophia is visible in the upper right corner. Topkapi Palace was used by the Ottoman dynasty until the 19th century when they settled into new palaces on the Bosphorus. Following the proclamation of the Republic, this magnificent palace, in which we can literally read the history of the empire, was converted into a museum at the behest of Ataturk, founder of Turkish Republic.